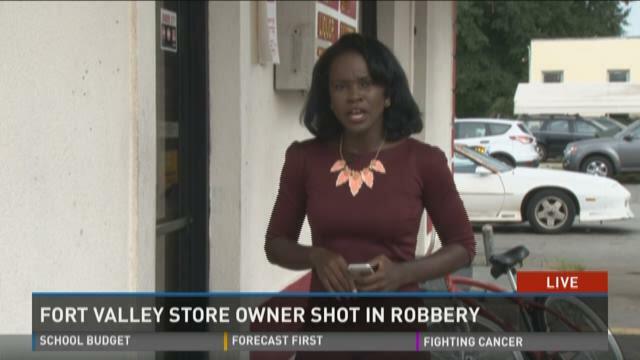 A store owner was shot during a robbery attempt at a Fort Valley liquor store Thursday morning. For the first time, several Central Georgia governments are coming together for a development project they expect will benefit all of them. They plan to grow business along, what they are calling, the "I-75 Corridor." Community leaders say this will bring more people and business to the area. If you get off the exit at Russell Parkway or Housers Mill Road, it will take you a few miles to find the nearest stores. "Our goal is, if we can create a vision for the area, so that maybe we can keep it from being hodgepodges of gas stations and convenience stores," says Jay Flesher, Flint Energies' Economic and Community Manager. Flesher is one of the people spearheading a group that aims to bring more business to the interstate. UPDATE 8-12-15 11:04 a.m.:The Fort Valley Police Department have arrested a 20-year-old man in connection to the shooting in East Church Street Tuesday around 12:45 p.m. According to a news release, Markes Alron Dassau is being charged with two counts of armed robbery, two counts of aggravated assault and probation violation. Deputies arrived to Indian Oaks Apartments Tuesday and found 25-year-old Anthony McGhee shot in the upper torso. The investigation led deputies to arrest Dassau, of Fort Valley. The investigation is still ongoing. Anyone with any information regarding the case should call the 478-825-3383. Seven programs were cut and nine people have been let go at Fort Valley State University following a "lengthy, transparent review of the entire institution." According to a statement issued Thursday from the President's Office, the programs being eliminated include General Business, Sociology, Computer Information Systems, English, Family and Consumer Sciences Education, Master of Science in History and Master of Arts in Teaching. For example, students can still take English courses, like English 1101, but can no longer receive a degree in the subject. The statement says the programs are being eliminated due to failed attraction and graduating the number of students necessary to continue the programs. Staff who were let go, according to the statement, were offered one-year contracts that will end in 2016. UPDATE: July 20, 2:45 p.m.
Peach County coroner Kerry Rooks says the death of an employee at Fort Valley's Blue Bird plant apparently was not caused by the heat. An autopsy was performed Monday on Clinton Jenkins. He was found unconscious in the bathroom of the Fort Valley bus plant Thursday and later died. Rooks says the GBI found that Jenkins died from natural causes, but "it wasn't heat related or anything like that." Jenkins had previous health problems and lost over 50 pound in less than a year, the coroner said. He may have died from a lung ailment. Rooks said GBI medical examiners may have a more definitive cause of death later this week. Jasmine South is a biology major at Fort Valley State University. This summer, she was able to try her hand at toxicology through lab experiments with her mentor, assistant professor of Biology, Celia Dodd. "Doing the research here that I've been doing this summer, I actually have more interest in toxicology now," South said. Toxicology is the study of poisons. "Things like pesticide exposure particularly in rural environments, have been correlated with diseases," said Dodd. Thanks to a nearly $400,000 grant, students at Fort Valley State will also be able to study this infectious field. Dodd, who is also a toxicologist, says it's important to get students interested, because while many may have never heard of the field, it makes a big impact on our environment. A Citgo gas station at 901 MLK Drive in Fort Valley was robbed around 11 p.m. Thursday. According to a Facebook post from the Fort Valley Department of Public Safety, two men went in the store, showed a clerk a handgun and demanded money. The clerk gave the men the money from the register and told deputies the men ran off. No one was injured during this incident. Detectives interviewed witnesses, collected evidence and processed the crime scene. The case is still under investigation. "We are grateful no one was injured in this incident, and we are asking for the public's assistance with identifying these subjects," Lawrence Spurgeon, the chief of Public Safety, said in a statement.